Sometimes I think folks forget what it’s like to learn to drive. You’ve spent your entire life until this point being kept away from devices that can injure, maim and flatten. Then you reach some arbatrary age and somehow it’s decided that giving you an object that can not only do all the aforementioned features but can do them to yourself at the same time is a good and logical idea. I was skeptical, but then walking the 6 or so ks from Phil’s house to the tram(25 min), which will take me to the train (50 min usually on a Sunday so I get to socialise with the weekend public transport weirdos) gets pretty old pretty fast. Infact it got old so fast I may never of actually done it, the mear thought of having to spend such a prolonged journey with the great unwashed rendered me unable to leave the house. Then there was the indignity of having to request lifts from my little (by 6 years) brother. So I told myself I’d learn to drive and self added that while I’m at it I may as well learn how to drive a manual. Because when have I ever made things easier on myself? The first hitch was that the only manual car I had access to was my grandmothers (who is fairly awesome – but due to her being fairly awesome she also has a life and I didn’t think she would appretiate her car disappearing every time I got the whim for a driving lesson). So my lessons were sparse and sporadic. I learnt very little. So cut to a few weekends ago where my dad informs me that there’s a Saab in a nearby car lot going for $5000. I really don’t like SAABs, to me they’re more boats with wheels than propper road transport. I wasn’t going to turn my nose up at a bargan, however on closer inspection the boat based description was accurate, right down to the water damage. What had really caught my eye was a spunky little black hatch on the other side of the car lot. It was all shine and leather seats. So for the past few weeks I have been owning and driving my own car. Being taught tag-team style by my brother, boyfriend and father. I can make it go (and stop)! And I’m getting good at getting it aroud corners. Those teaching me have complained of motion sickness, boredom and (my favorite) of being strangled by the seatbelt because my breaking is occasionally sudden. 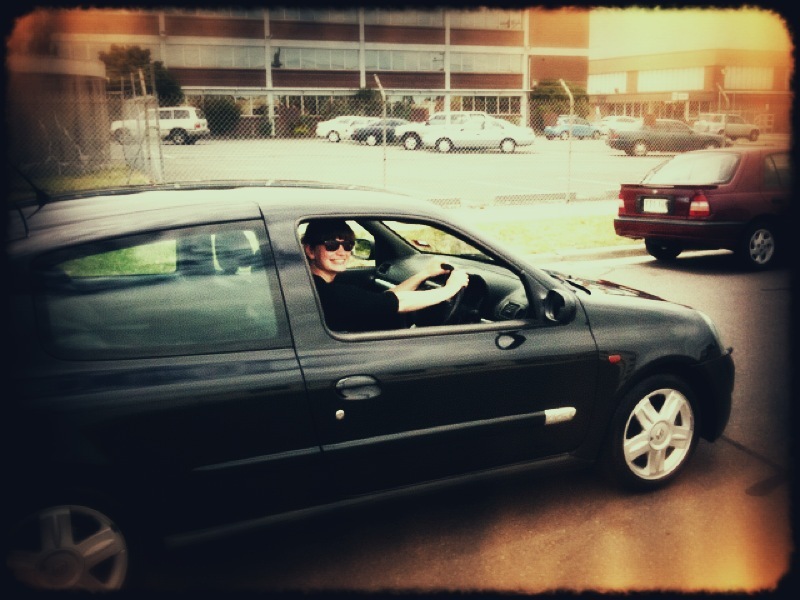 At this stage I don’t really feel like I’ll ever actually be able to drive, but I have been assured that will pass. As will the fear of other cars and speed humps.